From our Readers:“Paul! I’ve been looking for a replacement teakettle for several months now. I never thought finding a good quality teakettle would be so hard, but it is! Almost every review I read has complaints about all kinds of issues. Some rust, others the handle gets hot, ones that are supposed to whistle don’t. Please help! PG:“GR, it does seem incredible that it’s hard to find a well designed teakettle, considering they’ve been around for several hundred years. 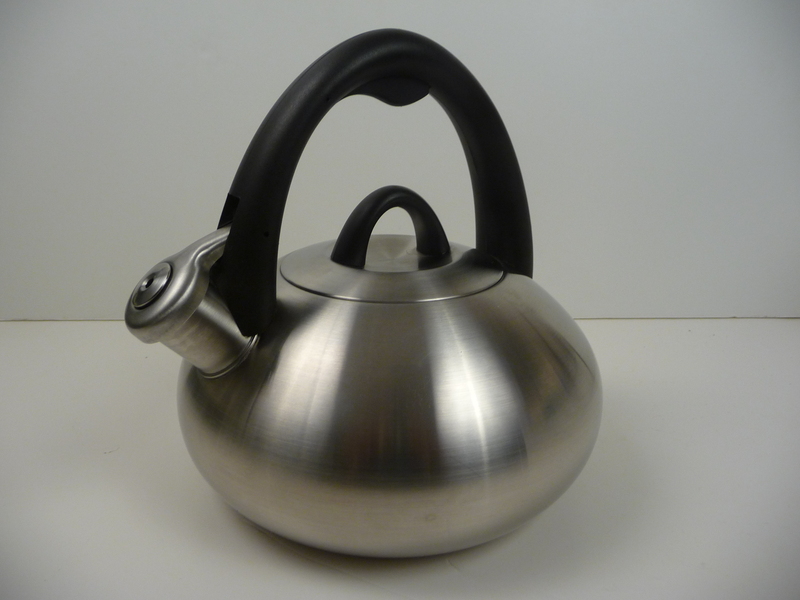 But since the teakettle also has a second role as “Kitchen Art,” creative design has often overridden human design. 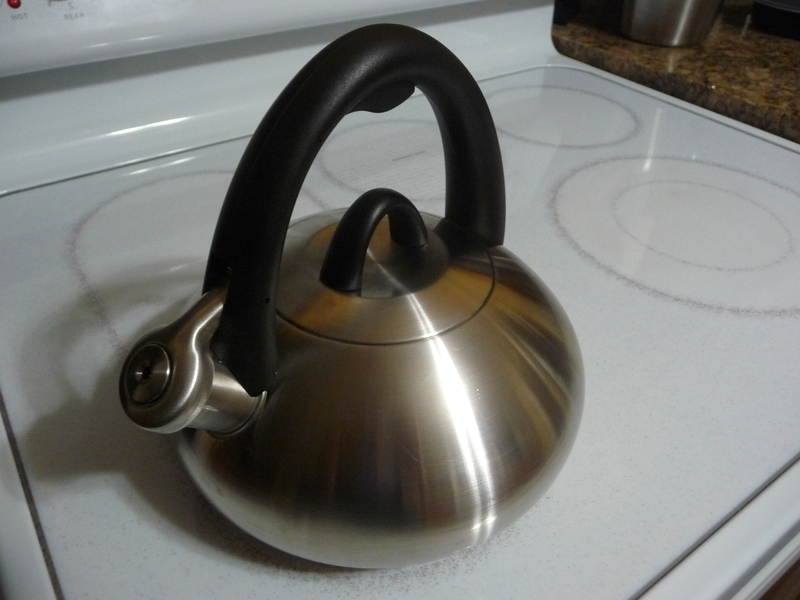 However, we found a teakettle that solves nearly all the engineering issues and has a simple, elegant style that beautifully integrates its superior human design. into a simple, attractive, comfortable to use teakettle. -It’s 2 qt. capacity provides plenty of water for up to eight (8) ounce cups, without becoming too heavy to manage. -The single extrusion body shape keeps the weight of shifting water well balanced. The beautifully integrated, spring loaded spout cap /whistle clearly let’s you know when its ready and pouring is safe and controlable. -The high arched, very heat resistant handle design is safe and comfortable. 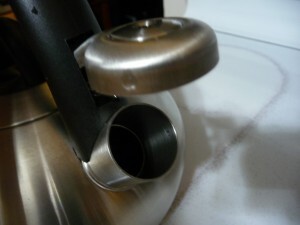 It has an easy to remove (see my technique photo below) but tight fitting kettle lid and wide fill opening to make faucet filling and cleaning easy. -In the three+ months of our testing, the Calphalon Stainless Steel Teakettle has proven to be exceptionally well human engineered, easy to use and fits attractively into a variety of kitchens. More than most items in our home, it’s use and presence often connects us to feelings of comfort and harmony. That’s probably why the Visual Design has very often taken priority over the Practical Experience of using it. When GR asked us to help them find a teakettle that incorporated both, we started with a Human Design focus and worked our way forward to the also highly important asthetics. 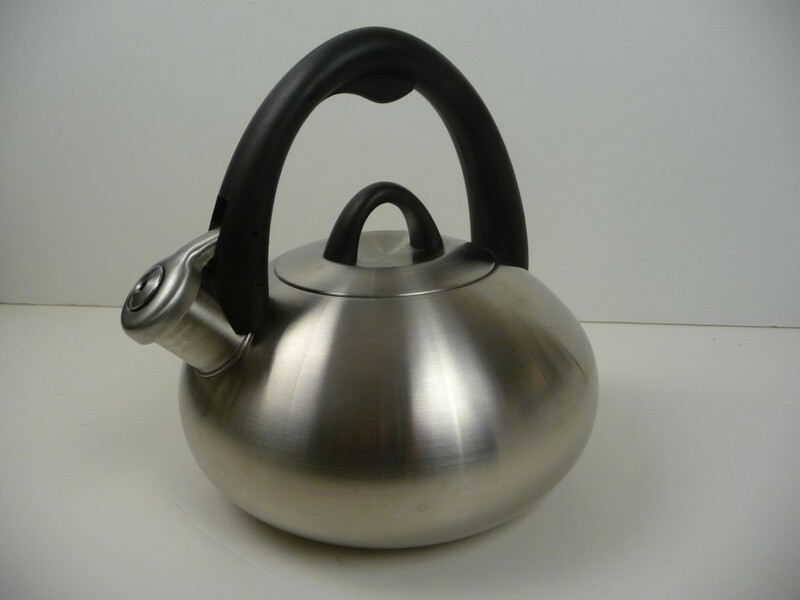 Our goal was to find a beautifully human engineered teakettle that was also beautiful to the eye and could fit into a wide variety of kitchen decors. has a great blend of the qualities a great teakettle should have. But, based upon our research, we came to appreciate how rare that is. Calphalon apparently also felt that form didn’t necessarily follow function in the teakettle world. During our research we found that they decided to leave the teakettle market completely for about a year. During that time they tasked their design/engineering department to start from scratch and create a design that not only solved the human design issues most teakettles have, but would also blend attractively into most kitchens. Based upon the positive and responsive experience I had reaching their customer service (in a reasonable time-under 2 mins.) and seperate conversations with different, but knowledgeable customer service personnel, their customer focus and desire to create quality products appears to be quite cultural. In fact, the new kettle design originally used a black plastic ring around the lift ring of the whistle. 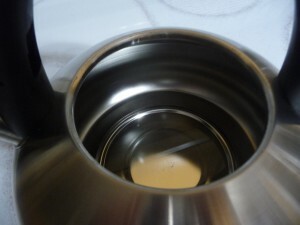 To ensure heat would not break down the plastic ring over time, they upgraded the lift ring to also be stainless steel. All current models now have this change. We highly value a manufacturer that identifies a potential issue and makes a running change. Cudos to Calphalon. I can tell you, having looked at thousands of products over the years, most don’t unless required to. Just Put Your Lips Together and Whistle……. 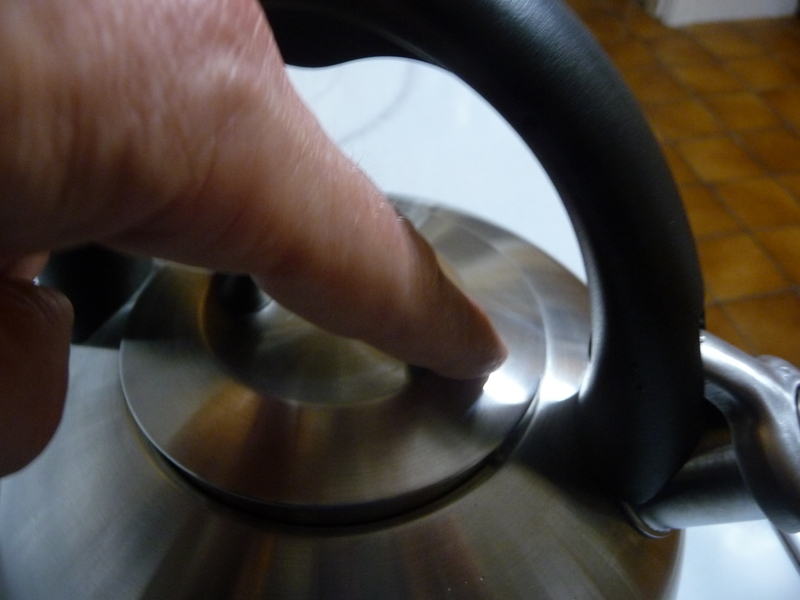 The number one killer of teakettles in America is…… boiling it dry. If you love your teakettle, warping it into avant- garde art can feel like you just killed your favorite plant. So, to avoid future heartbreak you need a good, strong whistle to blow when the water reaches full boil. The Calphalon Stainless Steel teakettle does this reliably and with a high pitched, but not un-pleasant, whistle easily heard from another room. No more “Oh, sh_t” moments, while running to it’s rescue. Once your water is ready, it needs to get into the cup safely. 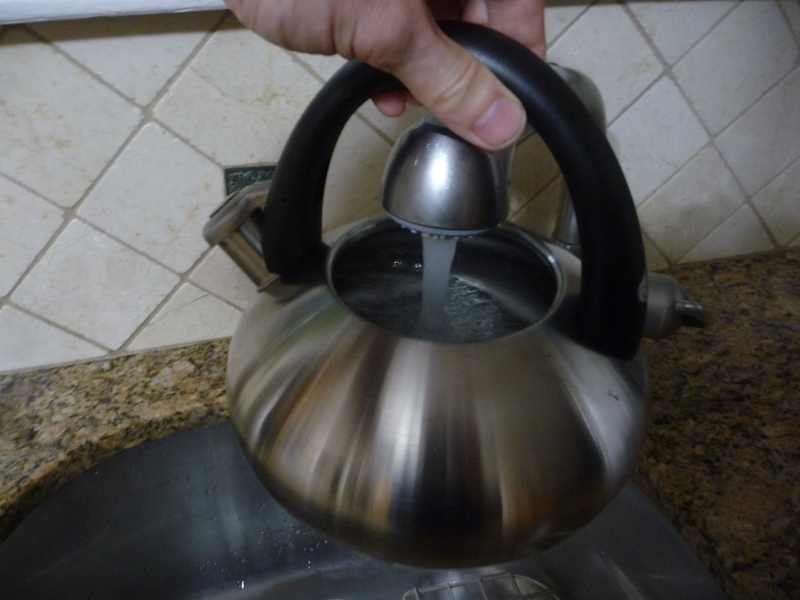 Ever attempt to pour your freshly boiled water and have it leap over the cup onto the counter? It’s both messy and a scalding danger. 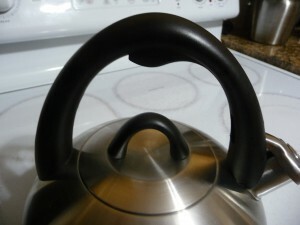 The spout design on many teakettles actually increases this problem due to its length and the narrowing taper of the spout. The Calphalon teakettle spout was designed with a short, wide, circular spout that when heated properly (see my note about flame height on Gas Stoves) eliminates the surging issue, even when pouring water at full boil. Yes, we tested this multiple times with a properly full (read “not over the Max” mark) kettle at full whistle boil. To also help keep you safe, the whistle cap is easily opened by a spring actuated, beautifully integrated, lever at the top of it’s handle arc. Click On The Video Below To See It In Action! Keeping the handle cool requires several elements to be addressed by the design and one by you. * The handle should be made of a strong, very low heat conducting materal. Why should you have to reach for a potholder or towel just to pour your water or open the lid without burning yourself? The “Philadelphia Arch” Calphalon handle uses a resin that has a very low ability to absorb heat and remains strong. 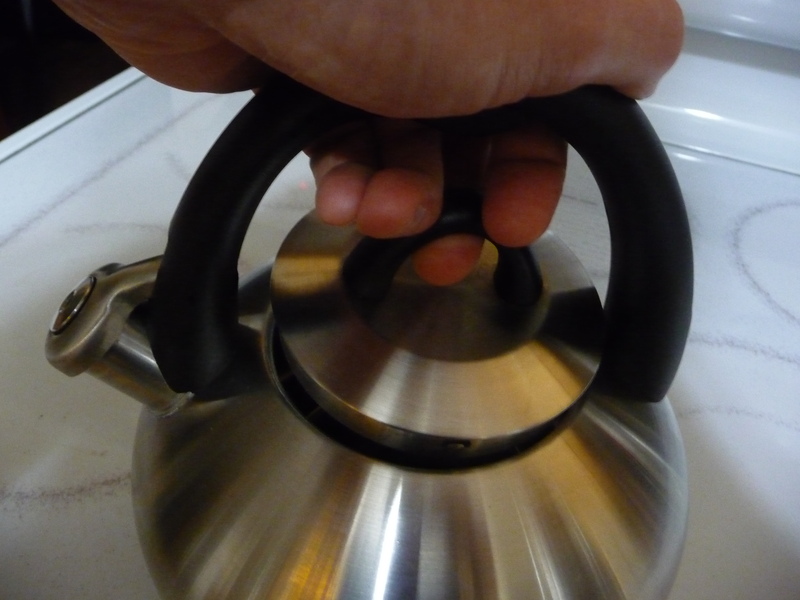 The same arched design and material is used on the kettle Lid Handle, keeping your fingers further away from hot metal. 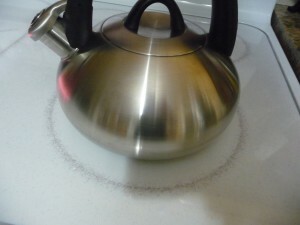 This arched lid design also makes removing the kettle lid easy. 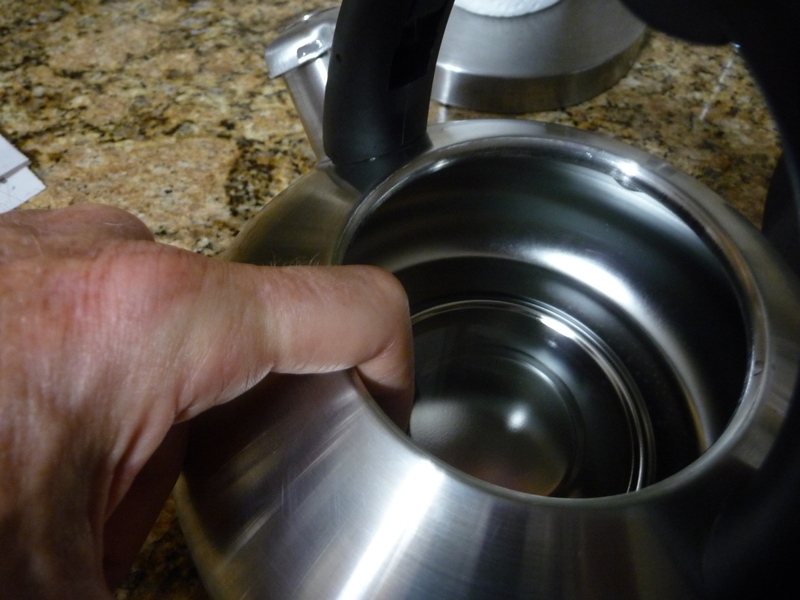 Here’s my tip to do it: Grip the kettle handle at the top of the arch, then hook the lid handle with your middle finger and pull up. Snap! As soon as the lid is cool, just press the lid back in place with the “arches” of the lid and kettle aligned for the next time. (nice). Calphalon design engineers also made it easy to fill the pot using most faucets. 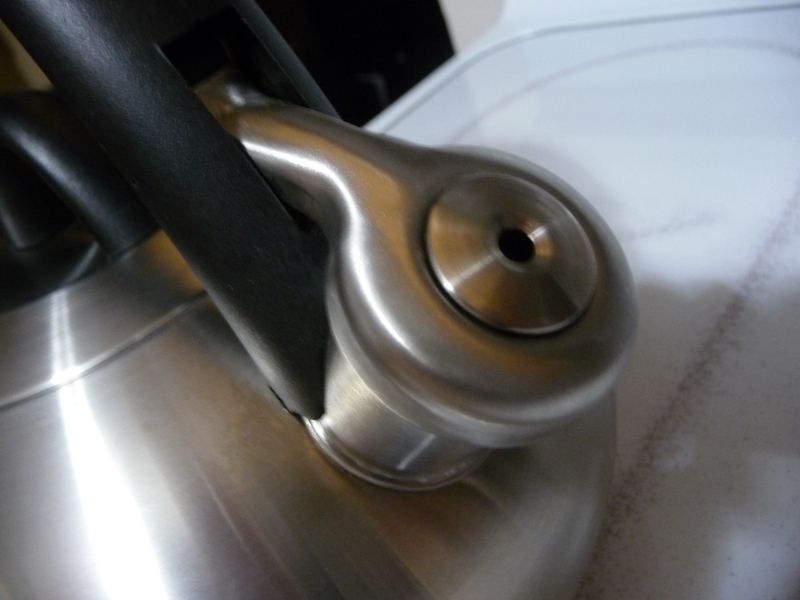 The High Arch handle and wide opening on the kettle allow you to slide most faucets under the handle to fill it. It also makes it easier to clean on the inside, if your water is high in minerals. There is a Max Fill line embossed into the upper side of the stainless steel pot. But unless you’re Superman, you likely can’t see through stainless steel to see it. Especially from the inside, where you need to see it as you fill. (no design is perfect). Overfilling can cause boiling water to overflow onto the stove or surge from even a properly designed spout and we don’t want that. But, I found an easy way to know when you’re at the Max mark, without X-Ray vison. While filling the pot, simply hook your index finger at 90 degrees over the rim at the second joint (the one just before your knuckle or if you have short fingers, at the knuckle bend). When the water rises to touch the tip of your finger, you’re done. Close enough and simple. The lid must seal tightly. 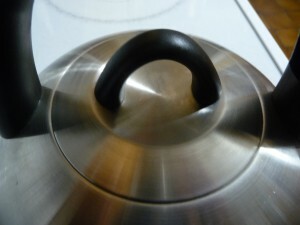 The lid should keep all but a small amount of steam (none are 100%) from leaking directly up into the handle above. This seal is also important to assure the whistle will actually sing. If the kettle lid allows much steam to leak from the lid area, there won’t be enough pressure to cause the whistle to blow (a complaint our User Experience research found was not uncommon). The Calphalon Stainless Steel teakettle lid seals with a tight snap, allows very little steam to leak towards the handle and keeps your mini-steam engine fully powering the whistle, once it reaches full boil. Just a note, the whistle will only blow when the water has achieved a full, turbulent boil. Our research found some users expected the whistle to blow at the point the water begins to churn within the pot, but adequate steam pressure is only achieved once a full boil has been rolling for a minute or so. In our tests it takes about 5-7 minutes (depending upon the BTU output of your burners) to whistle the kettle at the full 2 quart capacity. Less time, of course, with less water inside. And the type of stove (Gas or Electric) you have will also effect the heat transferred to the handle. The reason most stove tops are designed with different sized burners is to allow you to concentrate their heat directly into the bottom of the kitchenware you place on top. We found many people simply pick whatever burner is convenient, crank the heat to Hi and walk away. Unfortunately this is very “Un-cool”. The more the burner is oversized to the kettle bottom (or other kitchenware) the more heat is sent up the outsides and yep, into the handle. So, the best solution for preventing the handle from being bathed in heat, is to put the kettle on the burner best matching the size of the bottom of the kettle. Err towards smaller, not larger. If all your burners are the same size, more common on Gas stoves, adjust the flame level to stay within the flat bottom of the kettle. Cranking it further can do three things on Gas Stoves: 1.) It just wastes fuel, sending heat into the room and not into the water you are trying to boil. 2.) 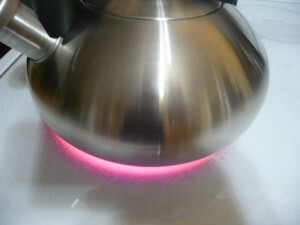 When the flames lick out and up the sides of the kettle, it will discolor the stainless steel finish. 3.) VERY IMPORTANT FOR GAS STOVES: When the flames lick out and up the sides of the kettle, it can also super heat the upper side of the kettle, heat the handle and can Cause The Water To Potentially Surge From The Spout, creating a spill hazard. Keep the flames beneath the pot and you’ll probably never have this issue when using a Gas stove. It never evidenced when using an Electric stove. Over time, most stainless steel will develop a more golden tone as the metal tempers. Periodic cleaning with a quality stainless steel cleaner (I list two at the end we found work well) will help keep your stainless steel kettle shiny and silver much longer. But the time in between cleanings can be greatly reduced by keeping the flames where they belong….. under the kettle. 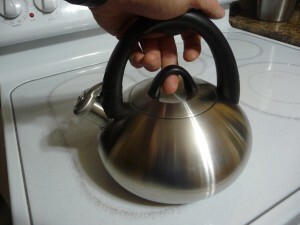 And last but not least, if something does become defective, your teakettle should have a solid warranty. The link to the Calphalon Warranty Agreement is in my FYI-2. You can Click Here or Below to see the latest competitive price at Amazon.com! A cup of mint green tea would be perfect right now! Our Disclosure: Manufacturers never influence our choices and we have no influence on pricing. get a solid deal on GreatStuffThatWorks products from a competitive, quality merchant. Thanks! Click Here For the Current Price at Amazon! Haven’t Subscribed Yet? We never sell your info (we hate that just as much as you do) and only quality research will trickle your way. Click Here To Subscribe to GreatStuffThatWorks! FYI-1: Here are three Stainless Steel Cleaning Products our consumer experience research and testing found are superior at polishing stainless steel (and some other metal surfaces). Some refrigerators, stoves and grills cheat and use a very thin coating of stainless or sometimes silver plating over tin or other metal, often with an acrylic coating on top. Using stainless steel cleaner on those can dull or erode the acrylic coating, so just use soap and water on those to be safe. If the acrylic coating is removed, the non-stainless metal underneath will begin to rust. Twinkle, Zep and Barkeeper’s Friend are proven leaders. Always read read the label for the recommended uses and safe applications. Click for The Current Price at Amazon! 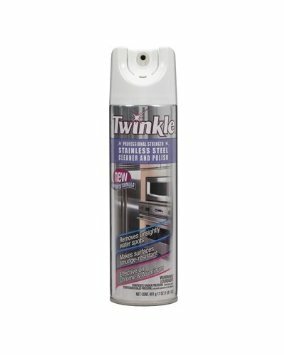 Twinkle and Zep are both sprays and do a great job of removing streaks, fingerprints and bringing back the like new shine quickly. The coating they leave also helps prevent the re-occurrence of finger prints, retaining the shine longer. Spray on, work it in a bit with a cloth and wipe off the residue. That’s about it. Twinkle is a very well liked product and is both effective and easy to use. Zep is also very effective, but has a strong odor, so ventilate the area when using it. Click Here for The Current Price on Amazon! 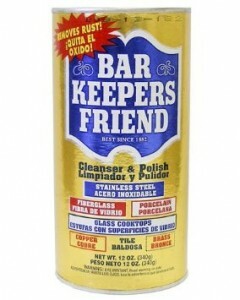 Barkeeper’s Friend is a long term favorite (over 100 years and counting) and is a great value. It contains Oxalic Acid, so read what surfaces it is safe to use on, mix the power with water (the preferred version of the product) into a paste to prevent scratching and Always rinse the surface after application, to avoid any remaining residue damaging the surface by prolonged contact. This product also has a variety of other versatile uses, so check the label for what you can and should not use it on and you’ll have great results. If you have a Glass Top Stove, it works great to remove burned on food and spills. 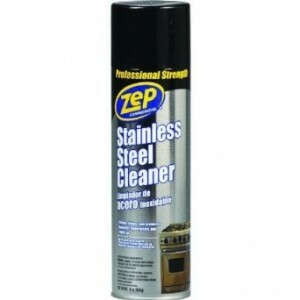 There are the three most effective stainless steel cleaners, according to our research.